MRI study reveals dogs and people share a unique voice-emotion brain connection which may explain why the dog-human bond is unparalleled in mammals. For years the scientific community refused to even consider any in-depth studies of the domestic dog. Scientists claimed that dog lovers suffered from sentimental anthropomorphism (attributing human motives and emotions to non-human beings). Not anymore. As the old song lyrics ask, "Who has the last laugh now?" Ethologists (those who study animal behavior) and neuroscientists (those who study the nervous system, including the brain) have taken a keen interest in canine behavior and in exploring exactly what goes on in a dog's brain. Some intriguing studies have provided insight into how dogs think and feel. 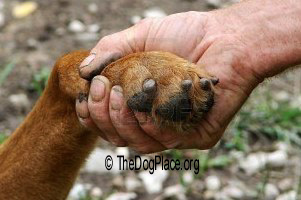 The results have demonstrated that dogs and humans share more traits than anyone ever imagined. A study done in Hungary by the Comparative Ethology Research Group has shown that one of those traits is a dedicated voice area in the canine brain. In other words, dogs are sensitive to acoustic cues of emotion, just as we are. The research team leader, Attila Andics, thinks that these findings suggest that the last common mammalian ancestor of both the human and the dog—and that would be about a hundred million years ago—developed this voice area of the brain. However, other scientists dispute this idea. What the findings indicate is the reason why dogs have retained such a unique relationship with humans for tens of thousands of years. We understand each other's emotional vocalizations. As Dr. Andics explains, "Dogs and humans share a similar social environment. Our findings suggest that they also use similar brain mechanisms to process social information. This may support the successfulness of vocal communication between the two species." 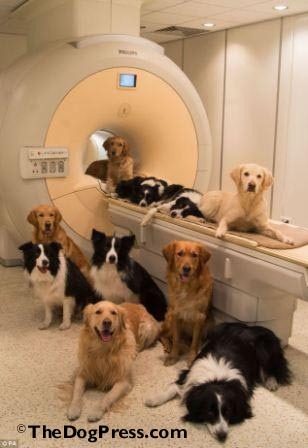 Andics and his colleagues trained eleven dogs to lie perfectly still in an fMRI (functional magnetic resonance imaging) brain scanner. Now if you've ever had an MRI scan, you know that the experience is not a pleasant one. Space in the machine is very cramped and very noisy. In order for the scans to come out well, you can't move your head more than half a centimeter. The researchers eventually caused the dogs to love the machine in once a week training sessions over twenty weeks. No doubt, high value treats were involved. "When dogs just arrive in the vicinity of building, they can't wait to get into the scanner room and can't wait to get on the scanner bed." Andics says. The team's efforts resulted in excellent neuroimages of both the dog and the human participants' brains —something that had never been done before. Researchers observed both the dogs' and the humans' brain activities while they listened to nearly two hundred vocalizations. These were dog and human vocal sounds ranging from whining or crying to playful barking or laughing. 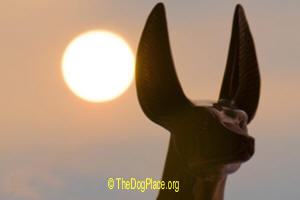 The images revealed that the voice recognition areas of the brain in humans and dogs are located in very similar areas. As one would imagine, the images revealed that the voice area in dogs responded more strongly to other dogs while the human participants responded more strongly to other humans BUT tthe research team also noted striking similarities in the way that both the human and dog participants responded to and processed emotionally loaded sounds. In both species, a portion of the brain near the auditory cortex lit up more with happy sounds than with sad vocalizations. And it didn't matter whether the "happy" voice was human or canine. It seems a burst of laughter is equivalent to a playful bark. This common response to emotion across the two very different species surprised the research team. Andics now plans to do a study investigating whether the voice-sensitive regions in dogs can code an individual's identity, as the region is known to do in people. With this available group of dogs already trained for brain scanning, many more regions of their brains can be explored in future studies, revealing even more secrets. Meanwhile, another neuroscientist, Gregory Berns, from Emory University in Atlanta, Georgia, began to study the brain of canis lupus familiaris, the domestic dog. His Pug, Newton, had recently died, causing Berns to wonder if Newton had loved him as much as he had loved his dog. As a neuroscientist, Berns knew that he needed to look inside the brains of dogs. 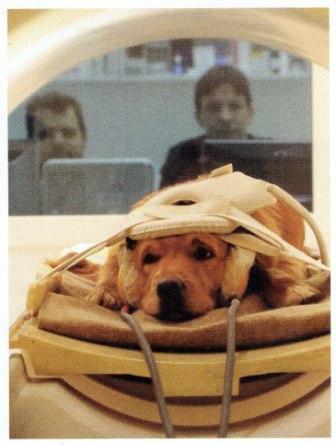 To utilize an fMRI with dogs was a formidable task. He went to work recruiting dogs from his local community, including a dog that he had adopted after Newton died. The dogs received training to climb up a series of steps onto a table, rest their heads on a pad inside the fMRI's inner tunnel, and hold still for thirty seconds at a time while the machine scanned their brains. (Oh, what chow hounds will do for a treat!) To muffle the noise of the fMRI which can surpass 95 decibels (or the sound of a jackhammer 50 feet away), researchers taped ear muffs to the dogs' heads' and piped in ambient noise over loud speakers. Instead of an abrupt loud noise from the machine, it arrived gradually over background noises. A dozen dogs have been trained so far to willingly enter the fMRI and participate in Berns' study. His research is still in the preliminary stages, but the research team has made some noteworthy discoveries. In several ways, a dog's brain activity mirrors that of a human's brain—and to a much greater degree than expected. 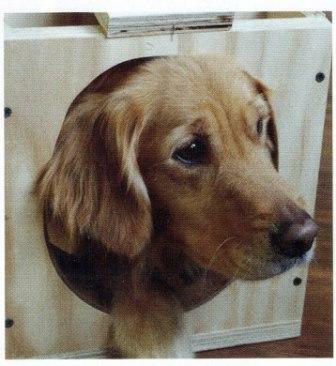 In several experiments, it was the caudate nucleus that indicated increased activity in the dogs' brains. This part of the brain in dogs as well as in humans has been implicated with voluntary movement, learning, memory, sleep, and social behavior. The caudate nucleus is rich in receptors for dopamine (a neurotransmitter involved in the sensation of pleasure). In humans and in dogs, research has shown that caudate activity is related to the desire to have something that causes pleasure, and the satisfaction involved in obtaining it. In one experiment, while lying in the scanner, dogs were exposed to smells of humans (their owners as well as strangers) and of other dogs (either dogs they lived with or unfamiliar dogs). As Dr. Berns explained, "We wanted to understand how dogs recognize other people and dogs in their households." Again, researchers saw increased activity in the caudate but only as a result of one scent. Berns related, "In this case, the reward system only seems to activate in response to the smell of a familiar human, which is pretty amazing." To further explore how dogs' brain activity correlates to the actions of humans that they know well, the dogs' owners left the room while the dogs were in the fMRI machine. Then the owners returned to the room, in sight of their dogs. Immediately, the caudate region of the dogs' brains lit up with activity. Berns believes that in some ways, the mental processes of dogs are not all that different from those of humans. Of course, in scientific circles this claim remains controversial. However, Berns maintains that, "Obviously, dog brains are much smaller, and they don't have as much cortex as we do, but some of the core areas around the brainstem—the basal ganglia, which the caudate nucleus is part of—look very much like those in humans." From an evolutionary perspective, Berns' statement makes perfect sense. Humans evolved the heavily folded frontal cortex for higher level thinking after we diverged from all other mammalian species. But areas like the basal ganglia, where the caudate nucleus is located, developed long before that divergence. Our ability to feel emotions existed far back in our evolutionary history in ancestors we share with many other mammals, including dogs. Other scientists may scoff now at the discoveries of neuroscientists such as Andics and Berns. However, as more and more information emerges from studies done on what is happening in dogs' brains, these findings and future discoveries by neuroscientists will silence many of the nay sayers. Observant dog owners have no trouble at all knowing that dogs share many and varied emotions with humans—including love. Someday science will agree with us. Man’s religious history from Anubis to King James to today. Dogs understand our emotions, MRI brain studies prove it. Therapy dogs can lower stress and their human's heart rate.